The Explanar Training System will improve your swing, give you greater consistency with your shots and, in turn, lower your handicap. The Explanar training system is available to use or hire for 30 minute or 1 hour sessions on the range whilst practising your game. Any golfer knows that taking your swing from the practice ground to the golf course is rarely easy. This is because knowledge, however well imparted, often leads to mental confusion, which in turn restricts the body from performing effectively. – the weight of the Power Roller plays a critical part in training and retraining the swing and eradicating ingrained faults in established players.
. This builds confidence and helps lower scores. 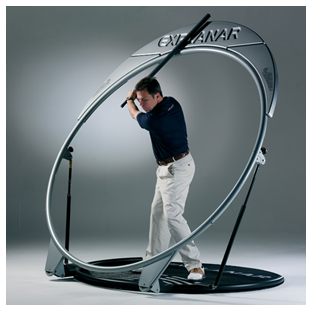 regular training on the Explanar targets the muscles specifically used in the golf swing. By using Explanar for just 10 minutes a day you’ll experience a dramatic improvement in your core stability and an increased level of rotation. Your forearms and legs will also feel the benefit of the Power Roller™ as your muscles are gently extended and developed. You should see a positive change in your physical appearance over time and as you progress you can acquire the “fitness” Power Roller. Before any practice sessions you must have an introduction lesson and sign a Health and Safety form stating that you have been shown how to use the equipment safely.